Map of St. Louis and Suburbs. 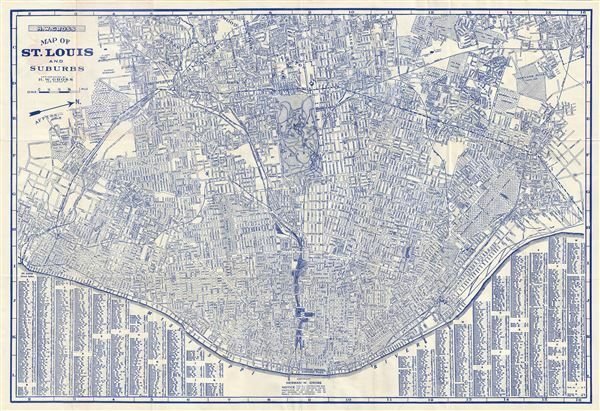 This is an impressive 1941 pocket map of St. Louis, Missouri, by H. W. Gross. This map, part of the 'City Guide and Map of St. Louis' tourist guide book, is centered on Forest Park and covers all of central St. Louis from the Mississippi River to the town border just north of the park. It also includes suburban regions to the north, west, and east. A street index appears just below of the Mississippi River at the base of the map. The map is exceptionally detailed and identifies streets, parks, rail lines, important buildings and other topographical features and is accompanied by an 88 page guidebook containing detailed information about the city. This map was published and copyrighted by H. W. Gross. Very good. Minor wear along original folds. Verso repair along fold in upper left quadrant. Accompanied by city guide book.